William Bradley “Brad” Pitt (born December 18, 1963) is an American actor and film producer. Pitt has received five Academy Award nominations and five Golden Globe Award nominations, winning one of each. He has been described as one of the world’s most attractive men, a label for which he has received substantial media attention. Pitt first gained recognition as a cowboy hitchhiker in the road movie Thelma & Louise (1991). His first leading roles in big-budget productions came with A River Runs Through It (1992), Interview with the Vampire (1994), and Legends of the Fall (1994). In 1995, he gave critically acclaimed performances in the crime thriller Seven and the science fiction film 12 Monkeys, the latter earning him a Golden Globe Award for Best Supporting Actor and an Academy Award nomination. Four years later, Pitt starred in the cult hit Fight Club. He then starred in the major international hit Ocean’s Eleven (2001) and its sequels, Ocean’s Twelve (2004) and Ocean’s Thirteen (2007). His greatest commercial successes have been Troy (2004), Mr. & Mrs. Smith (2005), and World War Z (2013). Pitt received his second and third Academy Award nominations for his leading performances in The Curious Case of Benjamin Button (2008) and Moneyball (2011). Pitt owns a production company, Plan B Entertainment, whose productions include The Departed (2006) and 12 Years a Slave (2013), both of which won the Academy Award for Best Picture, and Moneyball, which garnered a Best Picture nomination. Following a high-profile relationship with actress Gwyneth Paltrow, Pitt was married to actress Jennifer Aniston for five years. Pitt lives with actress Angelina Jolie in a relationship that has attracted wide publicity. He and Jolie have six children—Maddox, Pax, Zahara, Shiloh, Knox, and Vivienne. Since beginning his relationship with Jolie, he has become increasingly involved in social issues both in the United States and internationally. 1991 Thelma & Louise J.D. Ferdia McAnna (writer): Brad Pitt is in essence, eye candy for girls. Paul Tylak (actor): Brad Pitt is bad. Michael Purcell (actor): I have a whole new respect for Brad Pitt after seeing the film, The Tree of Life. He has been very smart in his career choices. He reminds me of Robert Redford, another smart businessman. 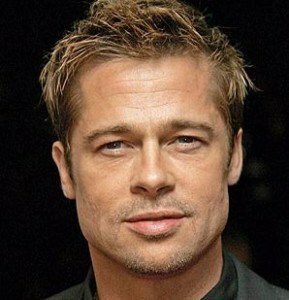 Alvean Jones (tv presenter): Brad Pitt? A lot of women fell for him 15 years ago. Dominic Mafham (actor): Beautiful, bold, warm, surprisingly human given he’s almost Godlike. Elfrieda Carroll: Undecided about him scruffy or hunky can’t make up his mind. Film fan: Brad Pitt – can occasionally surprise with an excellent performance. Status as pin-up sometimes undermines his ability. Also is under-appreciated as a comic actor. Maggie Dunlop: Like Brad Pitt as a person (share many of his views) but just an OK actor. Mind you, he’s been in some great movies. ‘Seven’ and ‘Thelma & Louise’ just to name two.